We’d love your help. Let us know what’s wrong with this preview of Me And My Fear by Francesca Sanna. To ask other readers questions about Me And My Fear, please sign up. Update: Since I first read this book several months ago, I've read a few other picture books addressing fear and anxiety. Although the illustrations in this one aren't my favourite, I think it has the best message I've seen about managing fear, so much so that I'm bumping this up an extra star. I love that it doesn't suggest you should eliminate fear altogether, only that it's important not to let it grow too big. Me And My Fear is a really insightful little book. 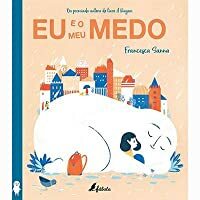 Francesca Sanna Update: Since I first read this book several months ago, I've read a few other picture books addressing fear and anxiety. Although the illustrations in this one aren't my favourite, I think it has the best message I've seen about managing fear, so much so that I'm bumping this up an extra star. I love that it doesn't suggest you should eliminate fear altogether, only that it's important not to let it grow too big. Me And My Fear is a really insightful little book. Francesca Sanna has done a delightful job of capturing how easy it is to let fear take over and rule one's life. We follow the story of a young girl who has a tiny companion, Fear. After her family immigrates to a new country, Fear suddenly becomes larger than life as the two face the loneliness and doubts that come with navigating a new world. I really liked the message here, that Fear is not always a horrible thing, but it's important to make sure it stays an an appropriate size. This would be a great story for any kid, but especially so for one who has trouble trying new things because Fear keeps holding them back. This is brilliant! After a girl moves to a new country and new school, her anxiety and fear grow, isolating and paralyzing her until she discovers a friend who has fears of his own. Who knew so many kids feel the same way? About change, anxiety, coping, and kindness. Enjoyed the embodiment of fear into an adorable imaginary friend and the subtle humor in the art. Shows positive role fear plays as well as the danger in letting fear grow out of control. This book perfectly followed the book on Mr. Rogers I just finished. He was very focused on children and the fears they face. This book speaks perfectly to children dealing with fear. The artwork was cute and gentle. It perfectly echoed the message of the prose. I loved the ending, with the pictures of everyone, the adults, children, animals, with their own little fear. This book not only shows fear and what it can do, it also shows compassion and what that can do to the fear of others. Sweet bo This book perfectly followed the book on Mr. Rogers I just finished. He was very focused on children and the fears they face. This book speaks perfectly to children dealing with fear. This book not only shows fear and what it can do, it also shows compassion and what that can do to the fear of others. Sweet book that would be useful for children who are experiencing a big move, changing schools or who are just generally fearful. 4.5 stars, rounded up to 5 brave stars! 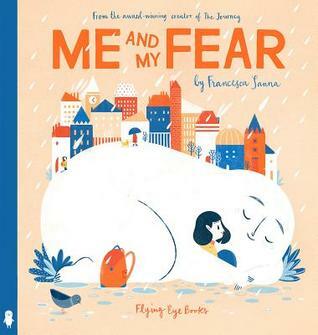 Often anxious and fearful Francesca Sanna writes a pretty wise and helpful book for kids about fears, which she suggests can be useful, but not useful to get too big. The illustration has a fear in the form of a creature whose size is manageable. The immigrant girl comes to a new country, new school, and is afraid. Of course, she is not alone in having fears! Beautiful book that shows the embodiment of fear and how it grows in a young girl's life as she transitions to a new country. I love the way the end shows that everyone has a fear and I hope this book is a comfort to children like the main character and an inspiration to other readers to welcome in and comfort anyone new to an unfamiliar place. "But since we came to this new country, Fear isn't so little anymore." Following on from The Journey and in answer to many questions from children she met, Sanna tells the story of one of the siblings after they had moved to a new country. Tying in her own anxieties and fears when integrating into a new culture, Sanna shares with us the young girl's beginning days at her new school and the acclimatisation of herself and those around her to this new start. From the seabirds flying in from The Journey's end, right at the start of this book, to the beautiful final dou Following on from The Journey and in answer to many questions from children she met, Sanna tells the story of one of the siblings after they had moved to a new country. Tying in her own anxieties and fears when integrating into a new culture, Sanna shares with us the young girl's beginning days at her new school and the acclimatisation of herself and those around her to this new start. From the seabirds flying in from The Journey's end, right at the start of this book, to the beautiful final double-page spread with a family of different ethnicities and various nods to characters and animals from The Journey, Sanna is writing and drawing for so many at just the right time. 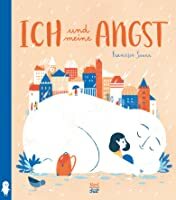 A story that explores anxiety in children starting at a new school and a new country with a new language, Sanna once again finds a voice for those who may have none. The fear in this book is well done too: a rounded ghost-like entity which is ever present and shown more as a outward part of herself which makes MUCH more sense. A young girl has a friend called Fear, who she takes with her on all of her new experiences and adventures. When she moves to a new school in a different country, Fear grows bigger and bigger to protect and keep the girl safe. But not everything is as bad as it seems when she builds a friendship with a boy in her class over a shared interest of art. Sanna has personified an abstract emotion in a clever way in which children can relate to. I like how Fear isn’t JUST viewed as just a negative thing A young girl has a friend called Fear, who she takes with her on all of her new experiences and adventures. When she moves to a new school in a different country, Fear grows bigger and bigger to protect and keep the girl safe. But not everything is as bad as it seems when she builds a friendship with a boy in her class over a shared interest of art. I loved this too much that I had to own a copy. Beautiful writing, great message that I think can be applicable to anyone, and impeccable art - it's so lovely and so warm. Francesca Sanna's art is adorable. It really makes this story come to life. A young immigrant girl finds that she is living with fear everywhere she goes - sometimes it's big, sometimes it's small, but it's almost always interfering with her life. When she starts a new school, she discovers something unexpected: every one of her classmates also has a fear, and they come in all shapes and sizes. A beautifully illustrated book with an important positive message. I received access to this title via Francesca Sanna's art is adorable. It really makes this story come to life. A young immigrant girl finds that she is living with fear everywhere she goes - sometimes it's big, sometimes it's small, but it's almost always interfering with her life. When she starts a new school, she discovers something unexpected: every one of her classmates also has a fear, and they come in all shapes and sizes. the personification of fear and how everyone has it. 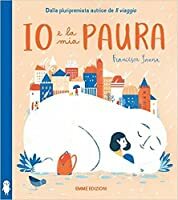 I really loved the illustrations in Francesca Sanna's The Journey (which I included in my list of picture books featuring refugees). So when I saw she had a sequel out, I jumped at the chance to read it. In a way, Me and My Fear picks up where the previous book leaves off -- a girl and her mother and siblings have fled a land of war (there are no national identifiers here in order to apply to the broader refugee experience). Here, she is trying to adjust to a new location where she is unfamiliar I really loved the illustrations in Francesca Sanna's The Journey (which I included in my list of picture books featuring refugees). So when I saw she had a sequel out, I jumped at the chance to read it. In a way, Me and My Fear picks up where the previous book leaves off -- a girl and her mother and siblings have fled a land of war (there are no national identifiers here in order to apply to the broader refugee experience). Here, she is trying to adjust to a new location where she is unfamiliar with the language and customs of the children around her. But she has a little friend who helps to protect her -- Fear. I like that fear is occasionally portrayed in a positive light -- able to provide some services that are good, and not as something that has to simply be eradicated from a person's life. But this girl's Fear friend soon grows so large that it keeps her from doing a lot of things. It causes her to feel lonely, anxious, and to engage in negative self-talk. This is also an interesting picture, as Fear is at once an essential part of the girl, but also something outside of her that she has to contend with when their desires are at odds. I thought the allegory was well done, and portrays this often tempestuous relationship in a believable way. In the end, one thing that helps the girl to deal with her fear is to recognize that, contrary to what Fear tells her, she is actually not alone -- the children around her all have Fear friends as well, even if they're often smaller than hers. This contrast between loneliness and solidarity was also helpful in understanding fears. I think this book could be very helpful, especially for anxious kids or adults, and even for those who are not trying to make the shift between cultures. Such a great book to follow Sana’a previous book ‘The Journey’, it is really effective in personifying fear and displaying it as a being that wants to stop you in your tracks doing what you want. It encourages children to fight their fears and overcome it. A lovely read. A great book to help children with starting a new school and becoming anxious. Can help with self confidence and helping children to overcome their fears. A little girl has a little Fear, which is good sometimes, because it can help to keep you safe (like cause you to be cautious around strange dogs, busy roads, etc.). But when she moves to a new country, her little Fear begins to grow and grow, until it keeps her from doing almost anything and makes her angry and frustrated. But then something happens which begins to slowly change her big Fear into something more manageable. 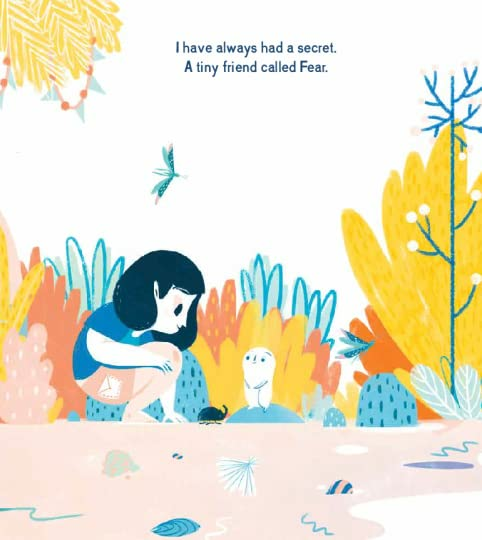 I wouldn't necessarily call these illustrations beautiful (at least in my A little girl has a little Fear, which is good sometimes, because it can help to keep you safe (like cause you to be cautious around strange dogs, busy roads, etc.). But when she moves to a new country, her little Fear begins to grow and grow, until it keeps her from doing almost anything and makes her angry and frustrated. But then something happens which begins to slowly change her big Fear into something more manageable. I wouldn't necessarily call these illustrations beautiful (at least in my opinion) but they're interesting and help to convey the meaning of the story well. Captivating. I read this standing up in my local bookstore. So beautiful illustrated. So beautifully articulated. So lovely. Nearly bought one for me and a friend. No children would have been involved, but I think it's also amazing for kids -- both for befriending their fears and building their empathy for others (especially immigrants). Sweet story, great pictures, even some humor. What more can you ask for in a picture book? This is a lovely story about a child who has fear all the time. The story mainly centers around a child having just moved to another country, but it also shows that everyone is afraid of something and it is possible to overcome one's fear. Wonderful encouragement to anyone with fears that hinder them. Great illustrations. 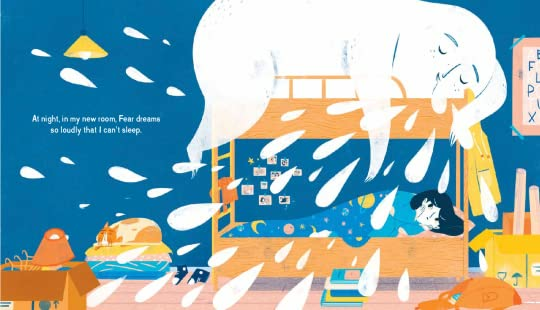 Gorgeous illustrations and an uplifting lesson about fear and anxiety. I'm a super anxious person and I wish a book like this had been in my life when I was a child! I'll definitely be recommending this book to families at the library when they are looking for empowering books for kids. Thank you to Nobrow for letting me read an advanced copy. What a beautiful story about the fear we all carry along with us. Reminds me of What Do You Do with an Idea? in the way that it presents an abstract idea but in such a very understandable way. Beautiful art. the detail is really nice i like what the fear represents and the drawing so good! Fear can keep you safe OR RUIN YOUR LIFE. Either way, though, it's a giant, puffy marshmallow man. How cute! Really great for developing social-emotional intelligence and understanding of anxiety/fear. Beautiful illustrations and a satisfying narrative arc. I love that the author gives a physical image to fear. A girl is walking around with fear, and it grows. Until she meets a new friend. Many kids will relate to this book. A great choice for SEL - anxiety - and building community - we all have our fears. 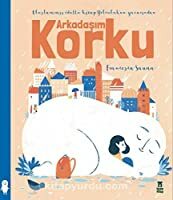 From the author/illustrator of The Journey, this could be seen as a companion text as it tells the story of a girl who is in a new country where she doesn't know the language and has fears about going to school and navigating everyday life. It can be read alone, but seems to become more poignant with the connection between the two books. Great way to teach children about fears and overcoming them. It also touches on a subject matter that may seem foreign to some preschoolers but is the reality for others; coming to a new country. It helps kids see a new perspective. We all have things we are afraid of, but mostly they don’t get in the way of our living our lives. Francesca Sanna shows us what happens when these fears get out of control. I appreciate the diverse collection of students shown in these charming illustrations. This book would serve as a great way to explain fear and moving past your fears to a young child. It also shows that we all have fears that we carry around with us but that doesn't mean we can't do the things we love. A young girl has a friend named Fear and she comes to discover that fear can come with her as she moves through life without being the biggest thing in her life.